As so many of us, I grew up down the block from a neighborhood duck pond. Regular family walks to feed them Wonder bread (a practice later banned for damaging the larger ecosystem) was a highlight of my toddler experience. At four or five years old, I was barely taller than the ducks. Surrounded by clean white feather bodies with tiny crisp eyes begging, orange beaks straining out to little hands full of crumbled white bread. It was exhilarating and scary, joyful and nurturing. That common experience taught us that the ducks needed us, we were there to help them. And yet on road trips out to the east end of Long Island, we passed huge pens of ducks without ponds, and asked our parents why we didn't feed them, why there was no lake for them. The message changed and we learned that these ducks would be killed for us to eat. Today, we dress our infants in onesies with baby ducks and read them board books with fuzzy ducklings to pet. New generations ask why we care for some animals and kill others for food. And the disconnect is repeated. 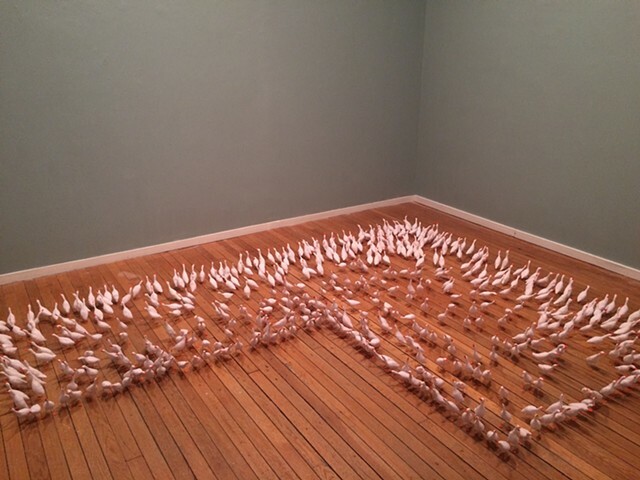 The Imprinted is an installation of 500 small (approximately 4” in height) papier- mâché ducks. Situated on the floor, against two walls of dreamy blue-green, the ducks are grouped in cornered spaces. They are huddled together necks stretching toward the viewer. I am exploring the zoological notion of imprinting, or how “young animals come to recognize other animals or people as a parent of habitual trust,” and how that expectation of protection is betrayed for an artificially constructed market for animal products. I aim to create a tension in the viewer by placing these miniature, fragile figures in an open gallery setting, juxtaposed to the heaviness of visitor footfalls. The repetitive process of building the paper armature, enveloping it with layers of papier-mâché, and securing wire feet, serves to reverse engineer the inhumane processes used to deconstruct the bodies of the living creatures for the food industry.